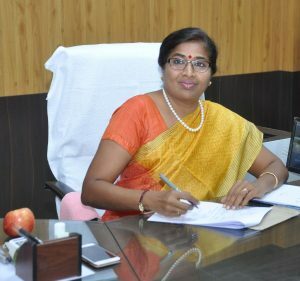 Smt Latha G ,I.A.S Collector and District Magistrate,is an officer of Indian Administrative Service belonging to batch of 2008. A native of Kancheepuram, Smt. Latha began her career as Junior Assistant in 1993, and later cleared Group I examination. She served as Deputy Superintendent of Police (DSP), Tiruthani, from 2001-2003. She later switched over to Revenue department and served as Revenue Divisional Officer (RDO) in Tiruthani and District Supply Officer in Thiruvallur. After a three-year stint in the Commissionerate of Revenue Administration, she served as Divisional Revenue Officer in Chennai Corporation (Elections) before serving as General Manager, Tamil Nadu Small Industries Development Corporation (SIDCO), during 2009-11 and then as GM, Women’s Development Corporation, till 2012. After getting IAS cadre in 2013, she served as Commissioner of Coimbatore Corporation for more than a year and then as Deputy Secretary of Industries department during 2014-15.She served as Director of Handlooms during 2015-16 before being appointed as Director of Disaster Management.